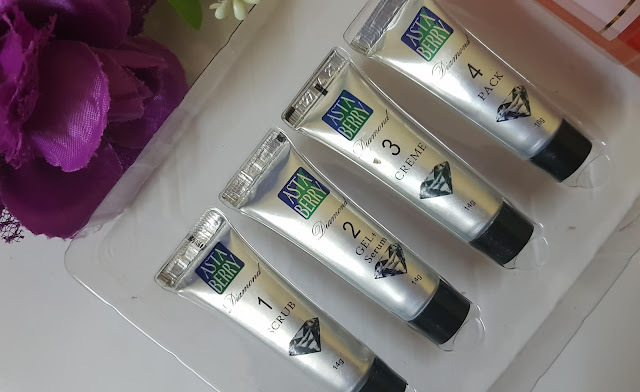 Astraberry Diamond Facial Kit Review! 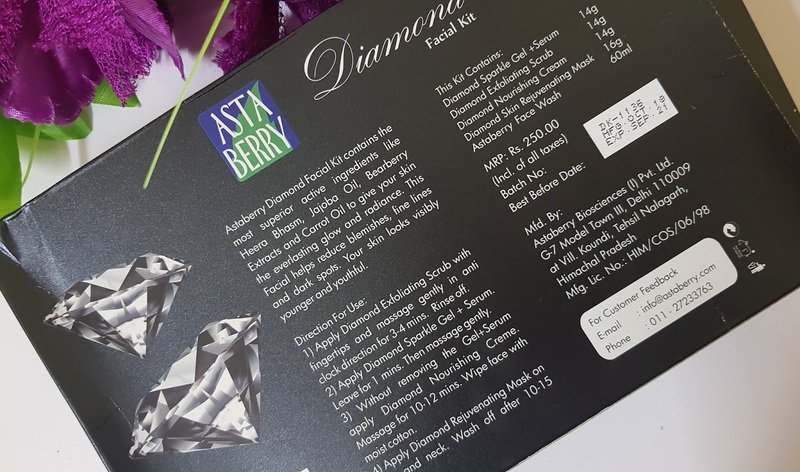 NAME OF THE PRODUCT: Astaberry Diamond Facial Kit. AVAILABILITY: Available on Amazon, Flipkart, Astaberry and other websites. 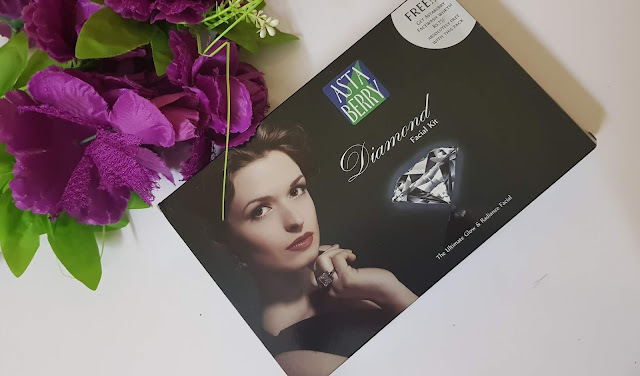 PRODUCT CLAIMS: Astaberry Diamond Facial kit contains the most superior active ingredients like Heera Bhasm, Jojoba Oil, Bearberry Extracts and Carrot Oil to give your skin the everlasting glow and radiance. 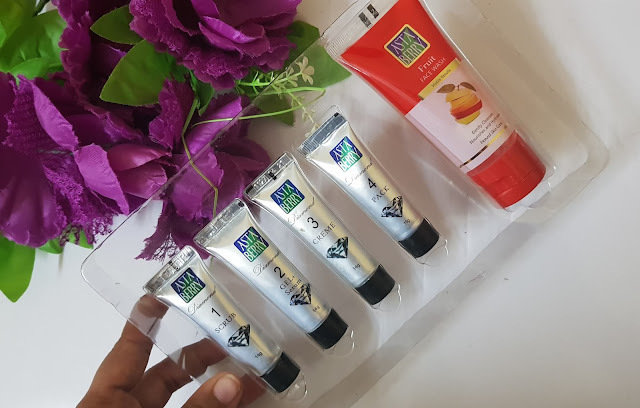 This facial helps reduce blemishes and dark spots.This Unique Facial Kit improves skin moisturization, firmness and elasticity. It help reduce fine surface lines and replenish depleted moisture. This facial kit provides you with everlasting glow and fairness. DIRECTION FOR USE: Diamond Exfoliating Scrub : Apply Diamond Exfoliating Scrub with fingertips and massage gently in anti clock direction for 3- 4 mins . Rinse off.Diamond Sparkle Gel : Apply Diamond Sparkle Gel + Serum. Leave for 1 min then massage gently.Diamond Nourishing Creme : Without removing the Gel + Serum apply Diamond Nourishing Creme. Massage for 10- 12 mins. Wipe face with moist cotton.Diamond Rejuvenating Mask : Apply Diamond Rejuvenating Mask on face and neck. Wash off after 10 - 15 mins. This Facial Kit variant is very versatile given that it's a mini one. This has only four steps so it can be a quick fix for those who can't spend too much time to apply the contents. The diamond is curated especially for attaining glowing and smooth skin. It claims to help in bringing back that natural healthy look of your face and keep it radiant. The ingredients of the kit include some of the most essential active ingredients such as Carrot and Jojoba oils apart from extracts from fruits. The kit also claims to help in reducing pimple marks and blemishes because of the lightening properties of the ingredients. Priced at only 250 INR (or approximately 4$), it's affordable and budget-friendly as well. The outer carton of the kit is black in color. It is a plain cardboard carton which contains all the essential information and details. Inside, you'll find five tubes, one of which is the free face wash. It has a scrub, a gel + serum, a diamond creme, and a face pack. Packaging is quite sturdy. I don't think any of the tubes will leak easily. Furthermore, they're securely placed in the carton which adds as a bonus. It's quite travel-friendly as well. You can carry the kit to your friend's place and have a facial day together. The consistency is quite creamy and smooth. 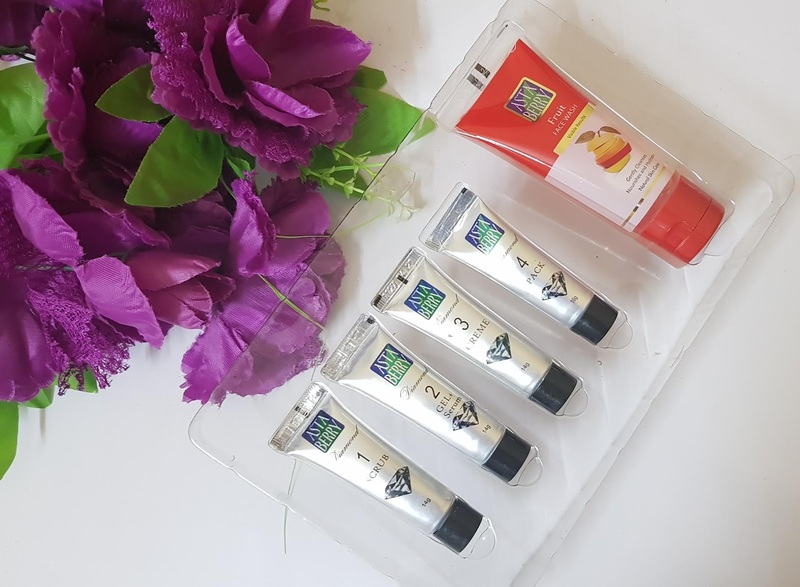 All the products are easy to apply and they are easy on the skin. A lot of times with other face packs, I have this itchiness which is really annoying but it wasn't there with these ones. The scrub, first and foremost is extremely lightweight and effectively removes the dirt and dead cells from the skin. I find it really soothing and not harsh on my skin. The gel + serum is thick and smooth and adds a supple bounce to the skin. It hydrates and nourishes the skin as well. Similar to this is the creme, which is very creamy and makes the skin soft. I feel like it has added a glow to my dull and dry skin. Lastly, the mask takes away all the pesky oils and dirt from the skin, leaving it feeling refreshed. There is a very faint but pleasant scent to all the products. It does linger on until the product stays on but fades away upon washing your face. I like the smell as it is really appealing. The Diamond Facial kit is true to it's name. It leaves my skin feeling nourished and smooth. I couldn't stop touching my face after the facial. 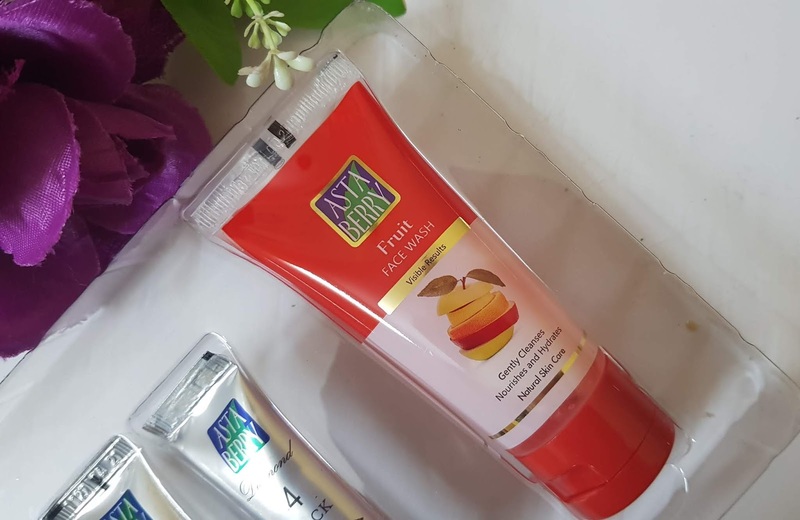 It does add a sense of freshness and charm to my skin. I love how effective the products are and how hassle-free the entire experience is. The effects stay for a long time. I follow the same skincare routine with washing my face and following it with a good moisturiser and I can still see the results. Adds a radiant glow to the skin. Easily achieves soft, supple and smooth skin! Doesn't take too much time. Can be used only once or twice. 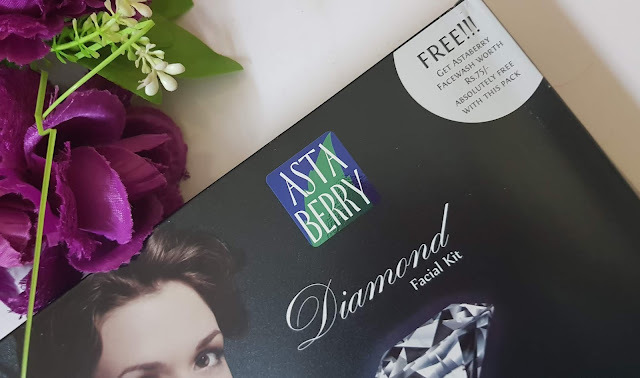 The Astaberry Diamond Facial Kit is a worthy kit which provides the much-needed nourishment that your skin has been craving for. It is created to help the skin stay soft and supple. It does add a lovely glow to the face. The packaging keeps the products secure and safe. Being so easy to use, you don't need to visit a parlor or spend your your hard-earned money on a facial when you can do it yourself. The instructions are easy to follow as well. You can easily achieve radiant skin by following the simple steps. The ingredients of the facial kit are natural and enhance the natural beauty of the skin. The free facewash that I received is an added bonus! 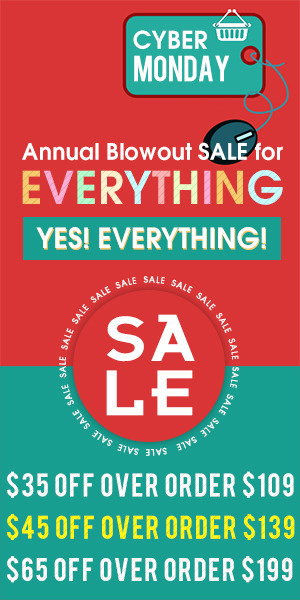 Priced at only 250 INR, it's extremely affordable and well-worth the price tag. I highly recommend it to those who can't find the time to visit a parlor and want to get radiant, bright skin without burning a hole in your pocket.